Earlier topic: What is the deal with "galley high"? Is this a good deal re: Adana 8 x 5? Just wanted to gather some insight into whether $300 for this Adana 8x5 is a good deal? The seller has clearly indicated that some parts are missing but can be purchased from Caslon in the UK however I live in Canada so I believe the shipping might be costly. I have tried using the manual and comparing it to the sellers pictures to try to determine what parts are missing and besides the obvious (handle, ink disc, rollers, chase) I was wondering if anyone could tell me if there is anything else that is missing and that would require purchasing? I would wait if I were you. 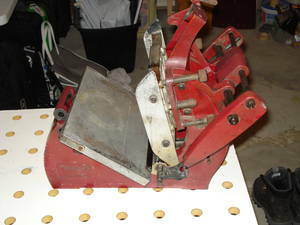 All of the missing parts are essential, and you very well may have to find a 2nd parts press in order to restore the first. That’s a lot of effort for a small press. I would also expect you to pay easily twice that price once everything is said and done to get it in working order. There’s plenty of opportunities closer to home. Write to Don Black or check the classifieds here, someone was recently trying to give away a fully equipped press in New York. what parts are missing and they are important enough. I guarantee that there are other parts missing, etc. My advise is to not get involved with this particular press as is. You probably could find some parts, but I doubt that Caslon could supply you with the most important part, the handle. 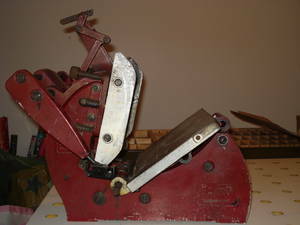 Keep your money in your pocket and wait until a complete press comes up for sale. They said that they sell a completely refurbed up and running press for £550. So, it looks like its not even really worth it, even if it was free.